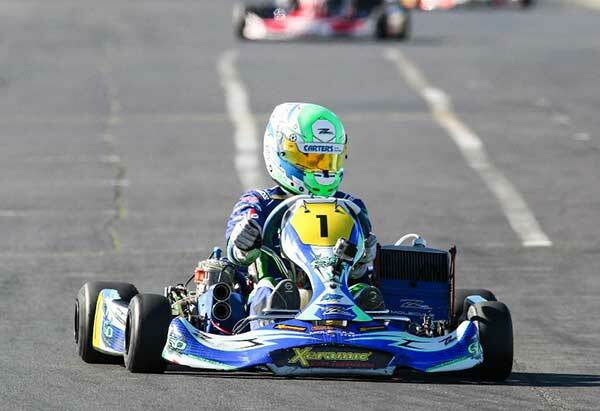 A dynamic Dylan Drysdale has taken the series’ points lead in the premier Wifiplus KZ2 class after a dominant performance at the penultimate round of this year’s Molecule ProKart Series in Auckland over the weekend. 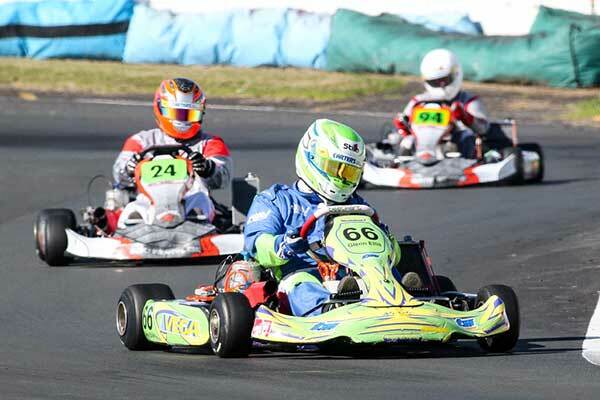 Heading into the round at the new Auckland Cup meeting at KartSport Auckland’s Giltrap Group Raceway, reigning class NZ Sprint champion Drysdale shared third place in the series’ points standings with multi-time former class title holder Ryan Grant. With Grant sidelined by an elbow injury, it was top Australian driver Troy Loeskow who provided the competition at Auckland. But former Palmerston North, now Auckland-based Drysdale qualified quickest, and after sharing heat wins and fastest race laps with Loeskow on Saturday was completely dominant on Sunday, winning the third heat, Pre-Final and Final very much as he liked. Loeskow and local class young guns Taylor Harte and Bradley Hicks also impressed, but Drysdale – literally – was unstoppable, further lowering the new class track lap record (set by Loeskow on Saturday) in the third heat on Sunday morning then going quicker again to leave it at 25.576 in the Pre-Final. The result is that Drysdale has leap-frogged former points leaders Mat Kinsman and Aaron Wilson in the overall points standings and has a seven point lead (over Wilson) heading to the Molecule series’ final in Hamilton in a fortnight’s time. Andrew Hunt had a similar start to Dylan Drysdale in the Aarque Group KZ2 Masters class, qualifying quickest and (in his case) winning the three heat races very much as he liked. But he was beaten to the line in the Pre-Final by fellow Aucklander Glenn Ellis, then excluded from the Final after failing to follow the correct notification procedure when making an engine repair between races. The result was that Ellis won the round from another Auckland driver, Enrico van der Griend, and van der Griend now leads the class points standings by three points from Tim Loughran from the Hawke’s Bay, with Brett Hollander from Auckland third, Darren Aislabie from Rotorua fourth and former points leader Andrew Hunt now back in sixth. Finally, normal service was resumed in the Aarque Group KZ2 Restricted class with defending title holder Garry Cullum from Auckland back on top, both for the round – which he won from Wellington pair Shaun Anderson and Jamie Pollock – and the series points standings which he continues to lead from Rotorua round class winner Regan Hall (Auckland), Anderson and Hamilton’s Aaron Wooley. Gerhard Benadie also had good round, the young Auckland driver the big mover (from P9 on the grid to P5 at the flag) in the Pre-Final before another charge, this time from P5 on the grid to third place – in the Final. 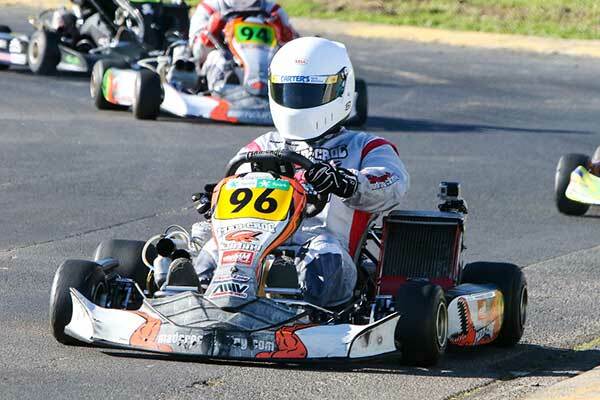 All eyes now turn to KartSport Hamilton’s Agrisea Raceway which will hosts the final round of this year’s Molecule ProKart Series over the August 12-13 weekend. Points after Rnd 4 of 5: 1. Dylan Drysdale 348 points; 2. Aaron Wilson 342; 3. Mat Kinsman 340; 4. Rhys Tinney 324; 5. Jordan Morris 319; 6. Caleb Huston 307. 1. Glenn Ellis, 2. Enrico van der Griend; 3. Brett Hollander; 4. Kevin Storr; 5. Darren Aislabie; 6. Garry Claxton..
1. Garry Cullum; 2. Shaun Anderson & Jamie Pollock; 4. Regan Hall; 5 Aaron Wooley; 6. Nelson Hartley. The 5th and final round is August 12-13 at AgriSea Raceway, Hamilton.